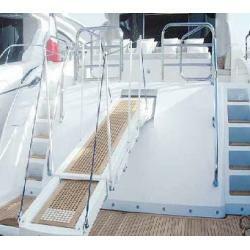 Passarelles & Gangways | Exalto Emirates LLC. Besenzoni passerelles, fully automatic and with hydraulic movements, fulfill all the on board requirements of a wide range of crafts. Being made of polished or powder coated s/steel and with the walkway available in a classic teak grating, the modern 100% braided-fabric polyester &ldquo;Rope Deck&rdquo; or solid iroko with rubber inserts, they blend perfectly in with any modern craft. All the remote controls are infra-red operating for maximum safety and the stanchions, which open up automatically. Wide range of customized solutions (colour, length, width, walkway material, stanchions).